You are not terrible at writing reviews for the books you love. This one is brilliant! I actually had never heard of this book until I saw your review on Goodreads, but now I really like the sound of it. It seems very creative and well-built, and I'm glad you mentioned that the villains aren't simply black and while. Those are my favourite kinds. I must get hold of this! I agree with Sam! Your reviews are always unfailingly eloquent, and this one is no exception. Your love for this book makes me want to pick it up right away. Especially since you say that all the characters are very well developed. Wonderful review, Keertana! Keertana, do not worry about your reviews, they are eloquent, succinct and a beautiful prose all on their own. I will tell you now, I simply adore reading your reviews because they always reflect a true emotion! This novel sounds absolutely brilliant. It seems to have lots of dimensions, interesting villains and lots of action. I haven't heard of it before, but thank you for putting it onto my radar! Keertana you never fail to amaze me with your gorgeous and witty reviews, I know how tough it can be writing reviews for books that you love, always tend to ramble or gush non-stop, but seriously you have done one heck of a job with this review, I can see how much of an impression it left on you and I love your enthusiasm for this book. I think despite A Face Like Glass, not being my typical read I could really grow to like Neverfell! Gorgeous review hun! This book sounds fantastic, Keertana! I have always loved middle grade and children's fantasy novels set in crazy worlds. Like THE PHANTOM TOLLBOOTH or even ALICE'S ADVENTURES IN WONDERLAND. I especially love when the stories can be read on a variety of levels and are surprisingly complex. The fact that the villains are not black and white is particularly interesting. I will definitely add this to my list! 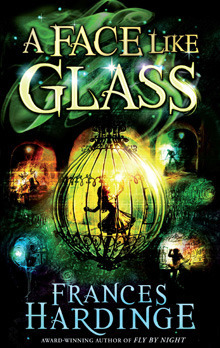 I've been hearing good things about Frances Hardinge lately, especially about A Face Like Glass. I usually don't read middle grade, but I might have to make an exception for this novel! It sounds so creative and whimsical, and I love the fact that it's like an Alice in Wonderland story but still sounds to be very much it's own story. Wonderful review, Keertana! Keertana, I just want to hug this review! You've done such a great job of capturing the subtle genius of Hardinge, the amazing Neverfell and the world of Caverna. That part where THE STORY JUST GOES MISSING?! Omg, I still get excited just thinking about how awesome that was to bridge to the climax. Love love love. Please read The Lost Conspiracy soon. Kthxbai. Wow! Great review, seriously when I love a book I wonder if I'm reviewing or rambling, but yours is a fab review and it's made me want A Face Like Glass right now. Have added it to my Goodreads list. This is a great review. Don't doubt yourself like that. Oh this proves that a good book is a good book no matter the audience it is intended. Wonderful review! Your review made perfect sense but I suffer from the same thing when I write a review for a book I love but don't worry your review was awesome and makes me want to read the book even more! A Face Like Glass tells the story of Neverfell, a girl who doesn't quite fit into her world, Caverna, a city below ground. In Caverna, magical foods are created and sold at high price to those who live above ground. But the people of Caverna can never leave, nor can they make natural facial expressions; they must learn to wear them like children are taught to put on clothes. When Neverfell, with her fluidly expressive face, is discovered, she throws the strange world of Caverna into disarray.